P.E. (Physical Education) helps students develop basic body control, explore concepts of rhythm and space and learn how to use balls, implements, and other equipment. Classes emphasize on working with partners and classmates and involvement in basic patterns of play and games. Students also learn the importance of following directions. 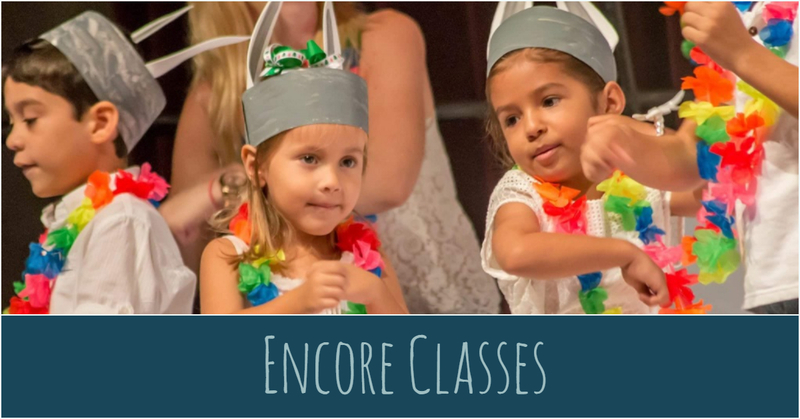 Performing Arts introduces and reinforces basic musical concepts through singing, movement, dancing, playing instruments, and structured listening. Once a year our PK students participate in a concert for friends and family. Media: Through weekly visits, PK students are introduced to story-time and book discussions, which are interwoven with the classroom curriculum. They also have an opportunity to use Smart Boards and interact with stories and games. STEAM (Science, Technology, Engineering, Arts, and Math): Once a week our PK students participate in hands-on activities where they learn to think like a scientist and develop observational skills. Students develop hypotheses, conduct experiments, make predictions, draw conclusions and figure out solutions to problems while learning new vocabulary, trying their hand at cooking, building amazing structures or solving mathematical problems. Art: Art projects are a part of each week’s activities; a wide variety of art materials are available during free-choice times. Art is fully integrated into child- and teacher-initiated language arts, social studies, science, and math projects, but our students also have an extra art class a week to learn about different artists, styles, techniques, and materials through in-depth projects that really bring the arts to life for them.